Good design communicates the pathways that exist in a space and offers clues regarding where to go next. The Foundation Architects uses visual cues like curved walls and pathways and smartly scaled entrances to help guide both adult and young dental patients to the next area—helping them feel at ease in an environment that might generally be associated with anxious feelings. 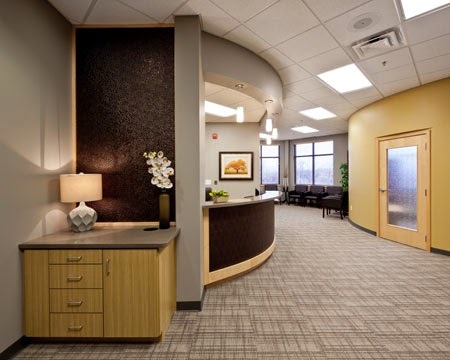 Visual cues like short walls also can cozy up and define an area of a clinic without closing it off. 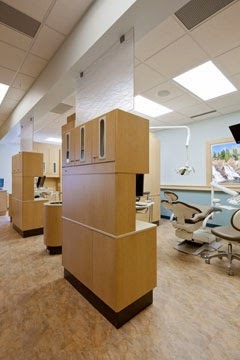 Here’s a peak at some of these solutions designed into dental clinics by The Foundation Architects. A reception desk with a curved frame welcomes patients of Siverson Dental Care (below) to the clinic. The wall opposite the reception desk also curves—creating a natural pathway that leads patients to a comfortable seating area after they check in. 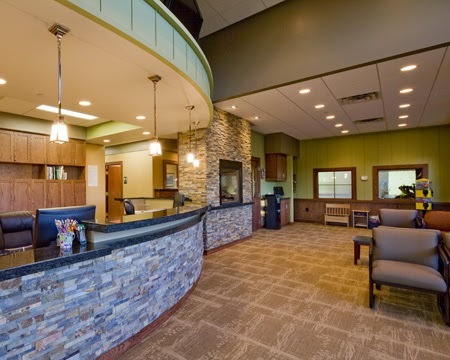 Chanhassen Family Dental (above) also uses a curved brick wall—and a warm fireplace—to guide patients to the seating area. Patients at these clinics are sure to be in the right frame of mind when the hygienist calls their name. Lakeland Family Dental caters to children’s comforts as well. 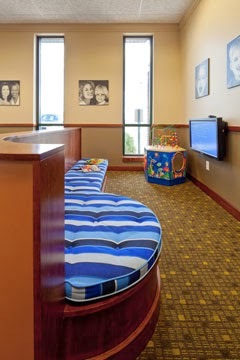 The reception area (below) sports a play area fully equipped with soft floors and a pint-sized entrance. Smile Designers (left) is home to a brightly colored kids’ area that’s partially screened off from the main area—which allows parents to keep an eye on their young ones having fun. 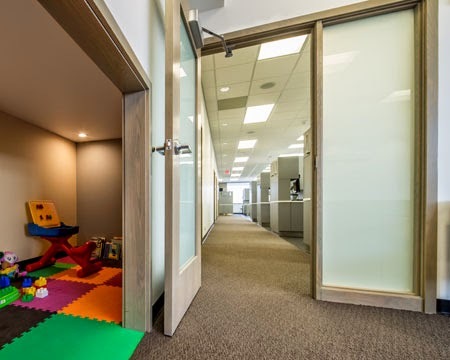 Both spaces are great for children to let off some extra energy before their appointment. Patients appreciate privacy, but smart design will prevent them from feeling isolated during treatment—enhancing their overall experience. At Woodbury Dental Arts (below), carefully positioned floor-to-ceiling cabinetry and three-quarter-sized “walls” (with frosted panes on top) are just what the dentist ordered. View more spaces designed by The Foundation.